But we have just had a very very good relaxed time, for about 6 weeks, when all our trouble where put to one side and we enjoyed ourselves with out any dramas. Having had this R&R where we haven't put our heads down the bilges or been scared by un-identifiable ships in the night. We are in fact ready to get the boat into check before heading off into the unknown. Some thing that has been looming at the back of our heads is that we are going to make a trip in the next few weeks, that could be our worst from a wind and sea point of view. So we are now in Grenada for a month with the notion we need to iron our any difficulties. We are also about to head into non-English/French speaking land and no-one on board is happy with speaking Spanish to sort out anything technical. 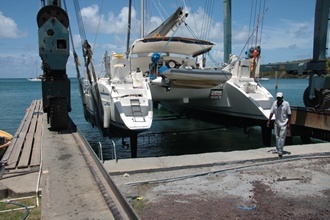 So after not much consideration we decided to haul out at a yard recommended by Catana Uses Forum on the internet, Grenada Marine. 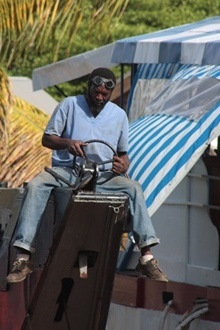 Especially, after we spent the evening in the yard bar, and discovered what a good happy place, run by good folk, seemingly happy workers and a large number of recomendations from other cruisers being hauled out during hurricane season. 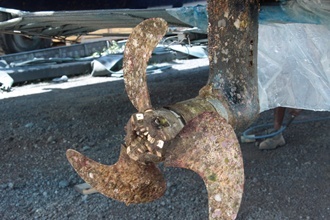 We also have a wobbly anode on the port sail drive (thats the leg that sticks out of the bottom of each hull that has the propeller on). It might have been alright to Panama, but I think probably not. Best to get it done, and at the same time have a load of other stuff as well. We booked the next available slot for haul and returned 4 days later. Spent a few days with Bonaire and Zepher Zest (OCC members, Andrew and Jo, from Luton) and then headed back to St Davids for a haul. Out she came and like nervous parents we stood by her, we then realised we were like every other proud owner, taking photos of what sermounted to a boat with a filthy bottom and propellers almost incapable of turning, bit like having a child with attitude problems at school, and a dirty bum, how proud can you feel!? 2, No water or water facility including loo, sink or shower. So given all of the concerns, we arrived with little to no provisions to spend 4 days on the hard. Colin keenly fixed on this time scale, me expecting the time to shift. Apparently I am a pessimist due to my consideration, I say a realist. so 8 days later we are relaunched, but by god we got stuff done. Our Yard experience, a bit like our other dry land experience was great, I am now wondering if this might be telling us something...............?! The Children met friends on the first friday in the form of Nathan and Georgia, the yard kids, or yardys and colin likes to call them. These guys are 4year old twins both considerably taller than our kids, mum comes from esher dad Grenada and who started the yard 12 years ago. The Kids had a fine time cycling round being watched by about 80 parents everyone who works at the yard. Cosmo suffered a set back initially due to his flat tyre, but after 2 circuits of the yard and boat colin was unable to find a puncher repair kit. But cosmo found a friend on the rusty old RUM RUNNER party boat in the dock for repair and we where taught how a local boy repairs a tyre....................... tye a bit of string around the hole. two holes down and the byc is riding well. The Rum Runner Workers arrived at 8.30 eachday and started to bang and bang and bang untill about 4.30, so are now known to us as the BANG BANG boys, Cosmo seems to have earnt respect from them and each time we are in the Yard lots of clenched hands are out reached to join in a bit of brotherly respect. After 3 days on the hard, peeing in a bucket seems the norm, but the mozies are driving us mad. We now have to close the windows at 4pm spray the boat and then leave it for a few hours, we then return to the boat full of chemicals, hot and airless. then we need to eat, I think this was my main problem and I definetly had enough of cooking after a week of trying to balance a families nutition whilst not having access to a shop or refridgeration. Showers that you don't need to turn off. and the Prize of all Prizes. Z & C where having so much fun they were invited to have a play date with Nathan and Georgia, the kids of the yard owners, Jason and Laura. Where else do you get hauled out, have good showers, a bar that surpasses most in terms of view and kids looked after for the afternoon by the owners of the yard ? ..................... result. 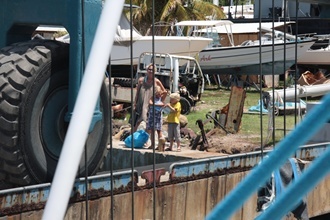 We love and recommend Grenada Marina to all with kids, even if childcare doesn't happen for all, the yard is safe clean and happy.